Provide comfort for the family of Hollis Long with a meaningful gesture of sympathy. Hollis Eugene Long, 84, of Boulder, passed away on March 30, 2019 in Windsor, Colorado. He was born to Hollis and Catherine (Michie) Long on January 11, 1935 in Mcallen, Texas. Hollis attended Texas Tech and graduated from Tennessee Temple as an ordained minister. He worked as a pastor for many years, and also retired from IBM. In addition, he and his wife started a Christian K-12 school in Boulder called Abundant Life School. Hollis proudly served for the US Army. He loved to tell people how, as an MP, he gave a two-star general a ticket for parking on the grass. He admitted, jokingly, it wasn’t the smartest thing to do. Hollis enjoyed reading books and was working on a book of his own at the time of his passing. He also loved participating in mission trips and traveling with his wife. Altogether, they visited seven different countries. Hollis is best known for his hilarious sense of humor, his steadfast ambition and for being a man of God. He is survived and dearly loved by his children, Bruce (Laura) Long, Arthur (Karla) Long, Rebecca (Gary) Consol and Valerie (Sean) Walker; 12 grandchildren; brother, Michie Long (Helene) and many extended family and friends. Hollis was preceded in death by his wife, Doris Long, and his parents. Life Celebration service will be held at 11 am, Saturday, April 6, 2019, at Journey Christian Church, 4754 W 31st Street in Greeley. The burial will be at the Louisville Cemetery at 2:30. 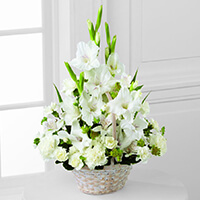 Your Florida Family - Keith & Danita; Ron & Pat sent flowers to the family of Hollis Eugene Long. Your Florida Family has you all in our thoughts and prayers. We loved and respected Mr. Long. He was a good and sincere man with such an innocent, kind, and good natured heart. Your Florida Family - Keith & Danita; Ron & Pat purchased the The FTD Eternal Affection Arrangement for the family of Hollis Long.